Its easy to find the tax bracket you're in. I can say that I'm in the 25% bracket. But that doesn't tell us what the real tax picture is. The other day I examined the marginal tax brackets for median income families. But to get the best picture of tax obligations for median income families you really have to look at the effective tax rates. Here's a brief example: Lets say you made $75,000 jointly and have 2 kids. You might look at the tax tables and conclude your tax bracket is 25%. But the tax brackets only apply to taxable income. Your $75,000 is not all taxed. Your standard deduction is $10,900 and your personal exemptions add up to 4 x $3500 or $14,000. So your taxable income is $50,100. That puts you in the 15% bracket. This however does not mean that your tax bill is 15% x $50,100. Your actual effective tax rate is dependent on the lower brackets as well. The first $16,050 of your income is taxed at 10%. Then the amount over $16,050 is taxed at the 15% marginal rate. So this means you owe taxes of $16050 X 10% + ($50,100-16050) x 15% = $1605 + $5107 = $6712. Your tax bill is $6,712. This equates to an effective tax rate of 8.95%. So your marginal tax bracket is 15% and your effective rate is just under 9%. Thats a big difference. So I crunched some numbers and figured actual tax bills for people making median income levels from 1947 to 2006. I used households with 3 people filing married jointly and I assumed standard deductions. 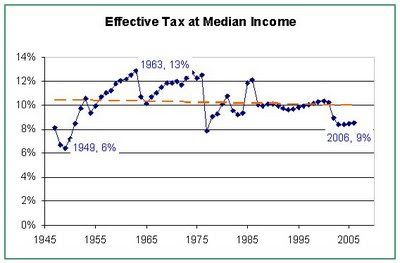 The average effective tax rate was 10.2%. The high was 13% in 1963 & again in 1974 and the low was 6% in 1949. I added the dotted orange trend line to show the trend over time. I also went ahead and figured the amount of the gross income that is actually taxable. So this would be the amount that you actually pay tax on, less your deductions and exemptions. Don't forget that you also have to pay the social security and medicare withholding rates. Thats currently a flat 7.65% off the top of your wages. This is a pretty considerable amount compared to the federal income tax. 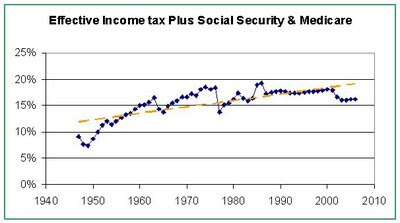 To see a better picture of the federal tax paid by median income earners we should add the effective income tax rate plus the social security and medicare withholding. 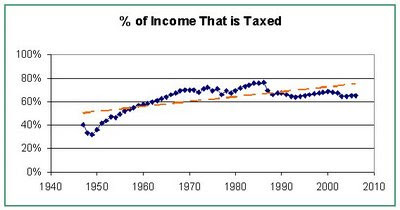 Combined the minimum was 7% in 1949 and the maximum was 19% in 1985 and 1986. I plotted an orange trendline and you can see the total rate is gradually increasing over the years. For the underlying numbers I used a number of sources: Historic tax rates are from the Tax Foundation. For the median income figures I used the family income levels from this census page. I got Standard deduction information from the Tax Policy Center and personal exemption data from Tax Foundation. Social Security and medicare withholding rates. A copy of the spreadsheet that I used with all the numbers is posted at Google Docs. If anyone wants more detail on the full figures behind the graphs please drop a comment.